This is an inspirational region with unique scenery which has been enchanting nature lovers and romantics for centuries. The Elbe Mountains, located in the southeast of Germany about 15 miles from Dresden, are also known as Saxon Switzerland. This is an inspirational region with unique scenery which has been enchanting nature lovers and romantics for centuries. Walk through the wild, rugged rock landscapes of the sandstone mountains of the Elbe Valley and experience breathtaking views of bizarre rock formations flanked by romantic valleys. The name “Saxon Switzerland” dates back to the 18th century, when Swiss painters exploring the area were reminded of their homeland. The area later inspired Romantics such as Caspar David Friedrich and Ludwig Richter. £569 per person based on 2 people sharing. Supplement for person walking alone £45. In this area ‘time’ is indicated on signposts, rather than distance, due to the frequent altitude changes. In order to get to the top of some of the table mountains you have to make your way through crevices, along narrow paths and climb steep steps and ladders. It is essential to wear proper walking boots. We recommend hiking poles for this area. Please note that some trails and the high points affording spectacular views are not suitable for those with a fear of heights. Daily 1st April to 31st October. Individual arrival in Bad Schandau, a well known health resort in the heart of Saxon Switzerland. You can use the arrival day to explore the city or a visit to the “Toskana Therme”, an indoor swimming pool combined with sounds and light over and under the water. Overnight in Bad Schandau. Beginning your walk through Saxon Switzerland, you will reach the impressive 11th century Hohnstein fortress before continuing to Rathen with its natural theatre, and the famous Bastei bridge, with a wonderful view over the Elbe river valley and the table mountains. Overnight in Kurort Rathen. 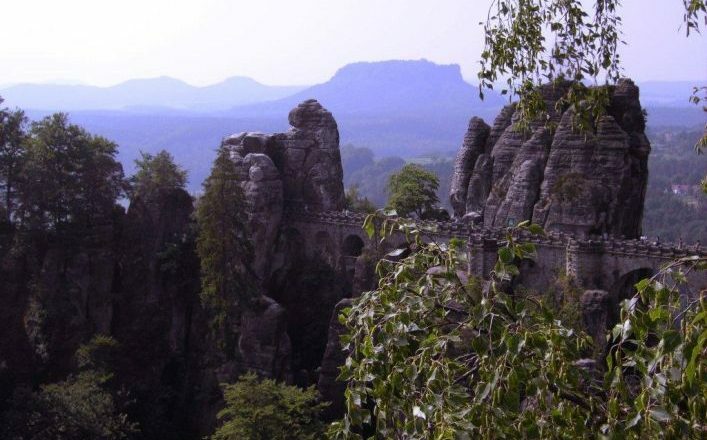 An early start is recommended to enjoy deserted Bastei rock. In Wehlen you will cross the river Elbe by ferry and then continue walking among the mountains “Großer und Kleiner Baerenstein”. The next highlight is the famous fortress “Koenigstein” which stands in solitary splendour on a 361m high table mountain. This impressive mountain fortress has an interesting history and offers a fascinating view of the equally impressive sandstone mountains and the foothills of the eastern Ore Mountains. After visiting the fortress carry on to Koenigstein for overnight. Follow easy and shady forest paths to the “Barbarine” rock formation and “Quirl Mountain” and climb up the “Pfaffenstein” from where you will have a wonderful view of the Lilienstein, a very famous mountain in Saxon Switzerland. Via “Muselweg” you will reach health resort town of Gohrisch situated in a tranquil and densely wooded area. Overnight Kurort Gohrisch. In the morning travel by train from Krippen to Schöna and take the ferry to Hrensko in the Czech Republic. Walk to the Rock Arch Pravcická Brána, the largest natural stone bridge on the European continent. It is considered the most beautiful natural form in Bohemian Switzerland and is the symbol of the entire area. The circular tour ends in Hrensko where you will again take the ferry and return to Krippen by train. Overnight Krippen or Bad Shandau. The last day is one of the most challenging. First you will take the ferry from Krippen to Bad Schandau and then the path to the “Schrammsteine” cliffs. A part of the route consists of steep ascents and metal stairways. Then walk along the “Affensteig” route and follow the “Malerweg” (“Artist’s Path”) to the Ostrauer Mill, a former mill which is now a tavern. Through the lovely “Kirnitzschtal” valley, ride on the traditional Kirnitzschtalbahn, an old tram, which will take you back to Bad Schandau. Overnight in Bad Schandau.